This is the last quilt for a while, I think. I have one more I'm working on but I've hit a snag with it and am putting it aside until I figure out how to work around the problem I'm having with it. This quilt started with the same April Cornell charm squares as this one, but I added florals to it to make it a bit more feminine. My kids say it'll work for a boy or a girl, which I think is true but it's certainly more girl-directed than the first one. 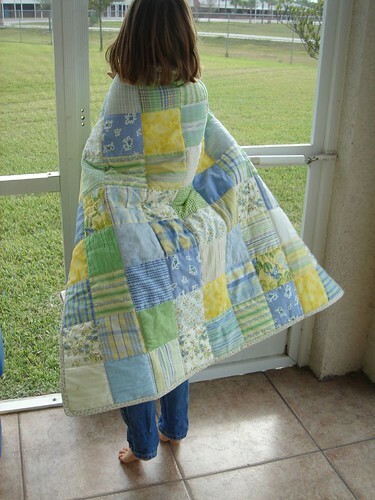 Maybe the two quilts are perfect for twins? K.'s crib set had flowers in it, and would have worked well for a girl, but I painted the room blue and accented with sage and cream and I thought it looked great for a boy (but then I'd put him in a pink Polo shirt, so what do I know?). 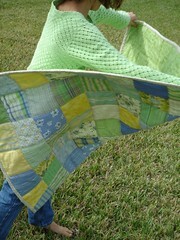 I was able to use some fabrics I'd been saving for quite a while in this quilt. Some of the florals are fabrics I'd used for projects when C. was little and it was so fun to pull them out again and find something that they matched so perfectly. Some of the other fabrics are coordinating April Cornell prints, my favorite is one with pretty blue butterflies on a yellow background. I love the vine backing fabric, I stayed away from something too floral in case someone did use it for a boy, or one of those babies who kept his/her legs crossed during the ultrasound. 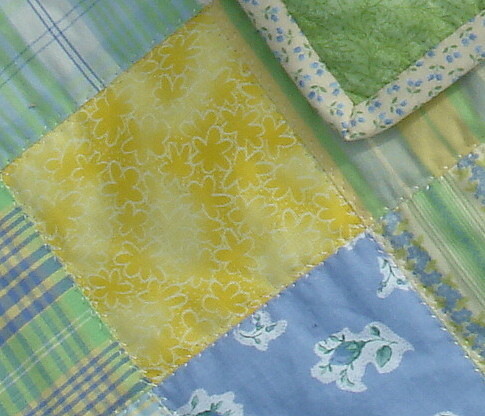 The quilting stitching is kind of a vine design, in a variegated green/yellow/very pale pink thread. My model was in heaven. I managed to take some great pictures of her while she thought I was photographing the quilt. When I was finished she asked if we could take MORE pictures, just a few more, pretty please. When I was pregnant with K. we sold our house and built our current one. Moving into a new house was exciting and I had great decorating plans for most of the rooms, especially the bedrooms and, boy, was it fun to do that decorating! K. was our first baby to have his own room. The others had all stayed in our room until they were about 8 months old, sleeping through the night, and then moved into a room with a sibling, or in C.'s case into her own room. Three of the kids had used the same crib and I. had had a metal crib that we had gotten rid of after he outgrew it. So now I had the opportunity to have a nursery, or at least a "baby room", and owning Ditto Kiddo made it easy for me to go all out without spending anything (the reasoning always is that anything we get from Ditto Kiddo we'll just sell when we're done with it ... famous last words!). One day the most wonderful, perfect crib and bedding set walked in the door. I fell in love and took it all home that day, storing it until the house was finished. And it was perfect, I added toile sage green curtains and a lamp cover and had the other kids paint pictures to frame on the wall. 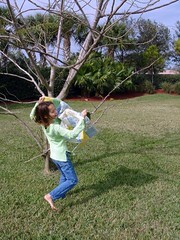 Last summer I found a really beat-up canopy crib at a garage sale for $25. It now sits in the garage, waiting for something ... most likely me to just get it painted (black, really ... I think it'd be stunning) and off to Ditto Kiddo, but if I were to ever have another child that's the crib I'd use (but I'm not having another child!!!) but without the canopy, just as a four-poster crib. The bedroom is now the sewing room. It looks nothing like a pretty nursery, more like a disaster area. Very pretty! 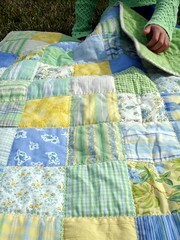 I would like to see more patchwork quilts this season. Especially in beautiful bright colors like the one in your pics. that's lovely, great story too. 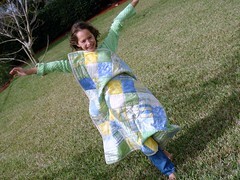 I just think it's funny that your model matches the quilt!